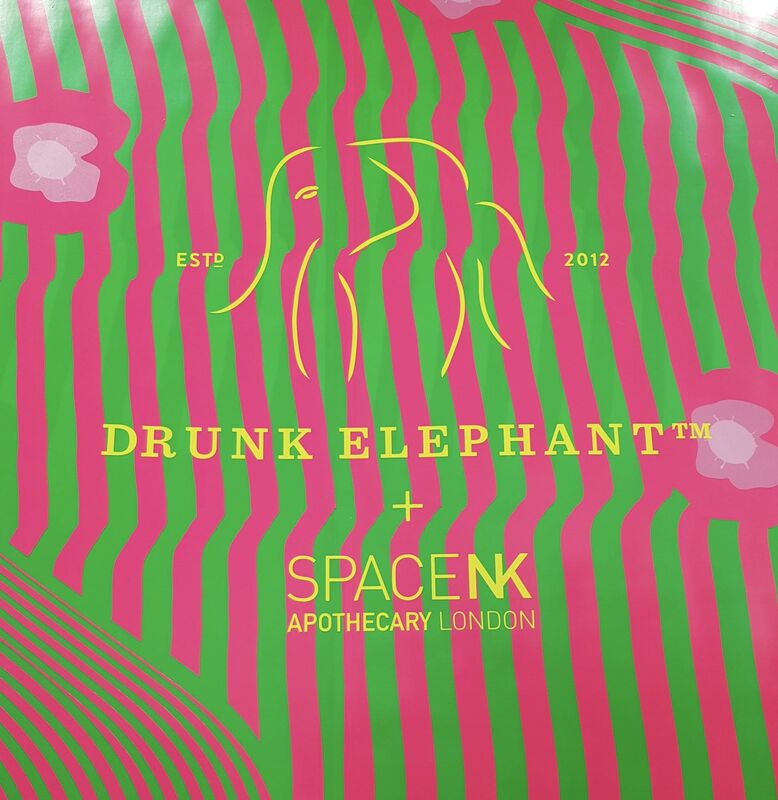 Drunk Elephant has well and truly landed in the UK with today seeing the official launch at Space NK. The hype surrounding the launch of this American skincare brand has been building for a long time now. 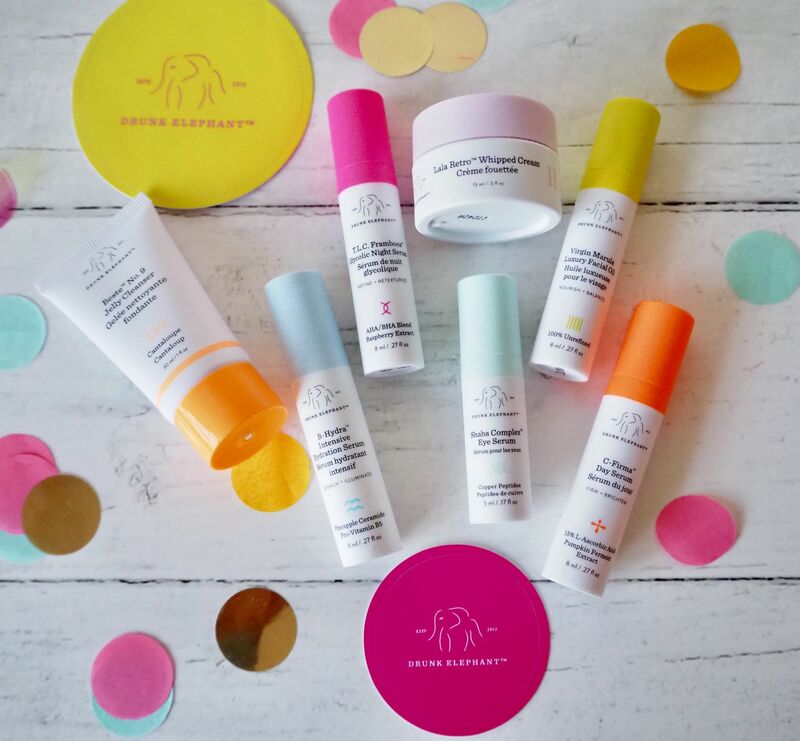 Drunk Elephant's UK release has been the most anticipated skincare launch of the year! Everyone is talking about it and by everyone I don't just mean beauty and skincare lovers. The launch has been widely reported in the press with some saying it could become the next billion dollar skincare brand. 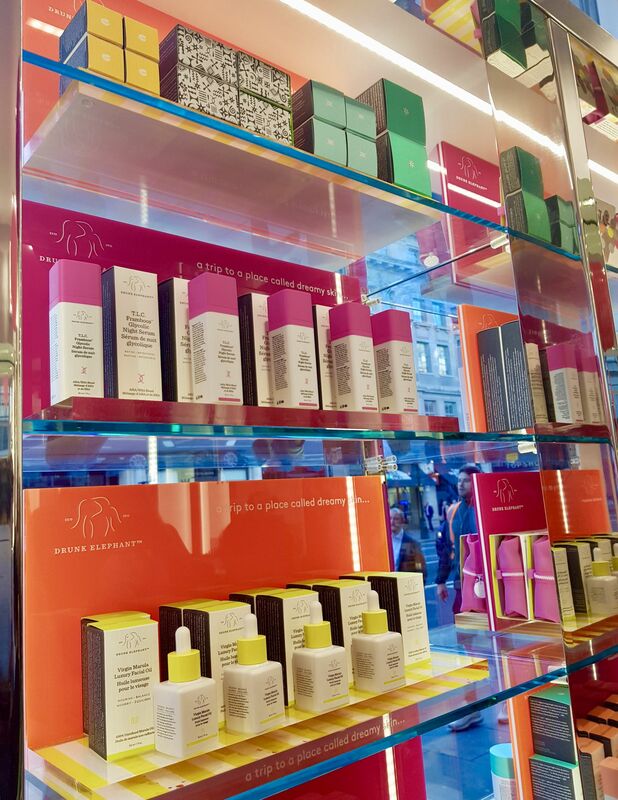 To coincide with the launch, Space NK opened a Drunk Elephant pop up in the heart of London's Covent Garden. 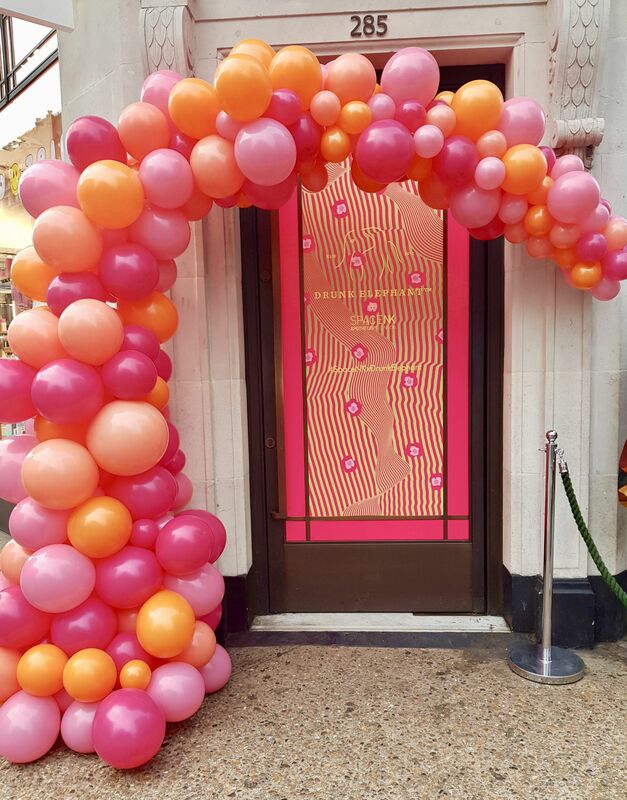 The pop up opened yesterday for just 2 days only and gave skincare fans a chance to purchase products ahead of the official release. Unfortunately I wasn't able to head down to the pop up due to work, but I was lucky enough to get a chance to attend a special meet the founder event with Drunk Elephant founder Tiffany Masterson at Space NK, bright and early this morning. 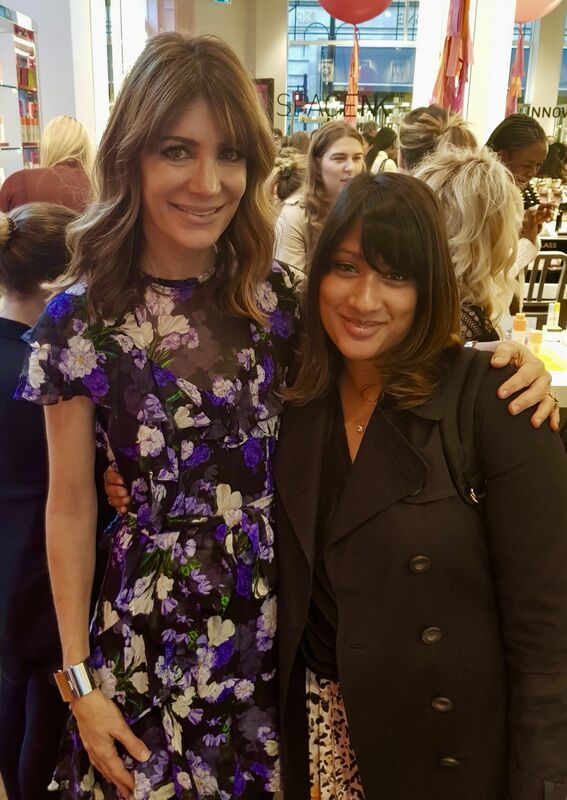 There was an incredible buzz of excitment at the event, perhaps not surprising especially when you've got a mega skincare launch and you're in a room full of skincare and beauty fans. 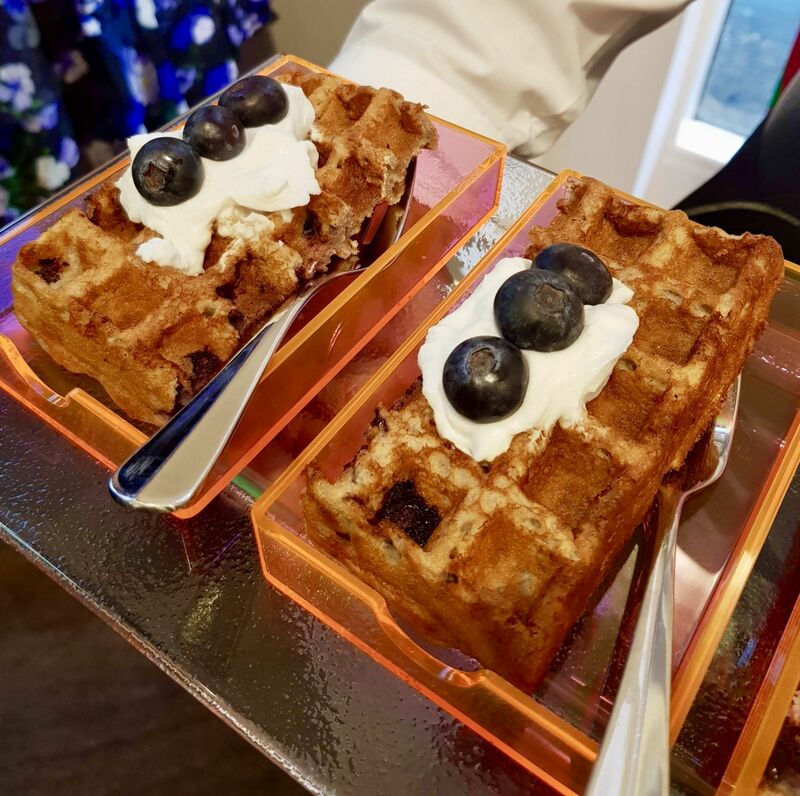 It was a really relaxed event with delicious heathy breakfast treats being served while Tiffany took the time to come and chat with us. To be able to meet Tiffany and get a chance to ask her about the brand and products was a huge highlight for me. Tiffany chatted away to a couple of us for about 20 minutes and gave us lots of general skin care tips too. What really struck me, was just how personable she was. She greeted us all with a handshake as we entered the store and thanked each of us for coming to meet her so early in the morning, she was really down to earth which just put us at ease. Tiffany told us that she'd been wanting to bring her skincare brand to the UK for the last 2 years. However there are a lot of legal hurdles to get through and it has been a lengthy process. There are EU regulations to be met before products can be offered to European consumers and Space NK have stated that some products such as Babyfacial and D-Bronzi are not currently available in their stores or their site as these products are still going through the process. Babyfacial which was one of Sephora's best-selling products of 2017, isn't available as EU rules state skincare products can't contain more than 10% AHA and Babyfacial has 25% AHA. So if you were hoping to try that out, unfortunately you'll still have to rely on friends visiting or living in the US for now. However Tiffany did share a little spoiler with us. Progress is being made and it's anticipated that D-Bronzi will be launching in the UK next April. Space NK also mentioned that the Umbra SPF products will be launching in 2019. The Drunk Elephant skincare philosophy is skincare without what Tiffany calls the Suspicious 6: essential oils, silicones, chemical sunscreens, SLS (a detergent), fragrance and dyes, and drying alcohols. Drunk Elephant delivers clean and compatible skincare formulated with cutting-edge synthetic and natural ingredients. Tiffany Masterson was a stay at home Mum who felt frustrated with the endless search for products that actually delivered what they claimed to. Driven by this she created something that didn’t yet exist in the skincare industry and founded Drunk Elephant in the US in 2012. 'Before I developed Drunk Elephant, I had all sorts of skin issues: combo, oily-in-the-T-zone, "sensitive" (or so I thought), occasionally break out prone, out-of-balance, with mild rosacea and visible pores. I was a frustrated, confused brand-hopper searching for a solution. Nothing ever really worked and if it did, it wasn't for long. I started selling a bar cleanser on the side, while teaching myself about ingredients, how skin reacts to them and what roles each play in a formulation.I identified 6 ingredients that I believed were at the root of my issues. Today I call them the Suspicious 6 because once eliminated, my skin returned to a clear, healthy and balanced state. I couldn't find products without one or more of the Suspicious 6 so I decided to make them myself.' - Tiffany Masterson As silicones aren't used in any of the products, it means the formulas can be easily mixed together for maximum results. These are known as the skincare smoothies and there are combinations such as the day-time, superfood and lala beauty sleep smoothie. This is the first time I've had a chance to try Drunk Elephant. Online reviews and articles made me want to just buy everything, but seeing Space NK talk through the different smoothies was really helpful. I've started with the Littles Kit which I'm very excited about. It's a selection of 7 travel size products, developed to balance and reset your skin and promises healthy, youthful and glowing skin. The minis can be used together and are suitable for all skin. 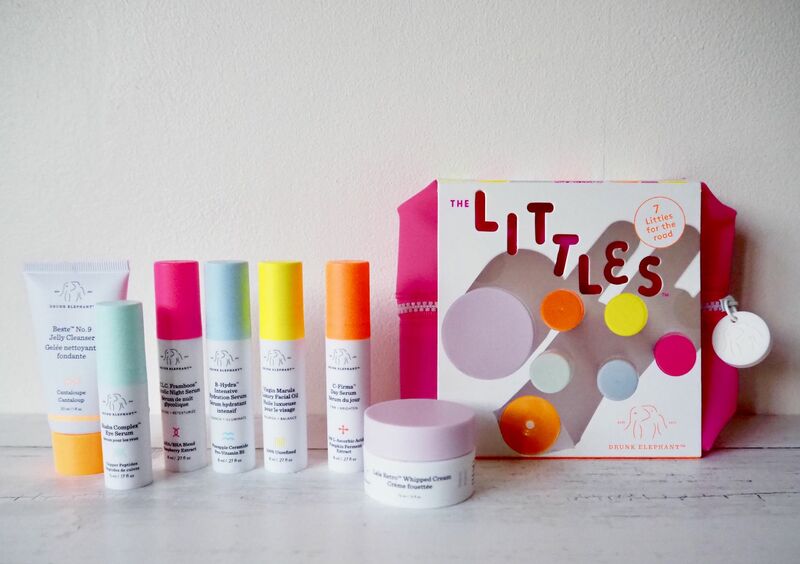 The Littles Kit contains minis of Beste No.9 Jelly Cleanser, C-Firma Day Serum, B-Hydra Intensive Hydration Serum, T.L.C Framboos Glycolic Night Serum, Virgin Marula Luxury Facial Oil, Lala Retro Whipped Cream and Shaba Complex Eye Serum. Tiffany mentioned that the kit has enough product to last 30-40 days so it will really give you a chance to see the effects on your skin. I love that the products are travel friendly too as I'll be able to take them with me on my trip to Porto next week. 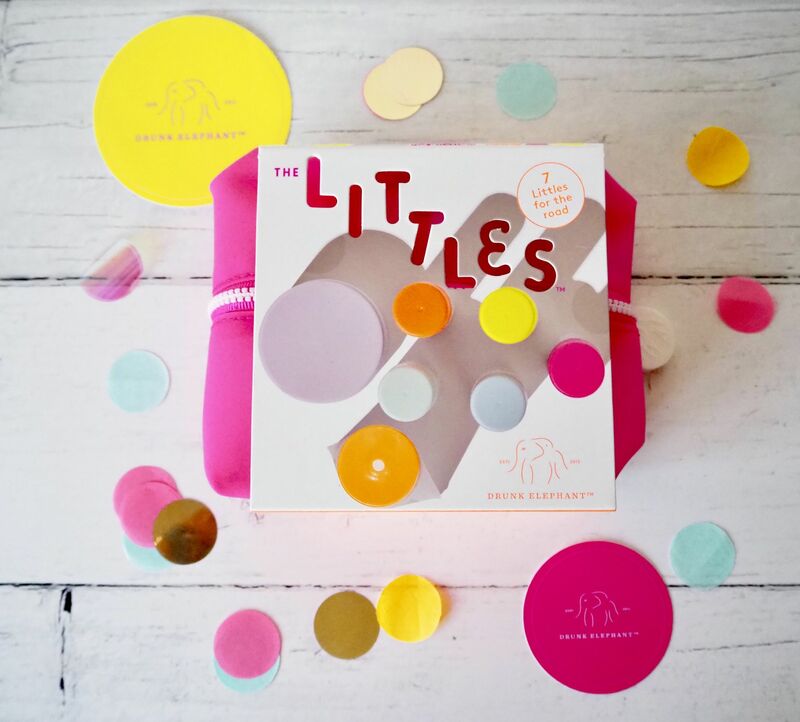 I'm not the only one who's excited about the Littles Kit, it's already sold out online, but Space NK promise there'll be more in stock tomorrow. I'll be trying out the Little Kits over the next few weeks and I'll let you know how I get on. I asked Tiffany how she came up with such a memorable name for her brand. She told us that she fell in love with marula oil and it's incredible skincare benefits and so she began to research the oil in more depth. This led her to videos online of elephants getting tipsy by eating marula fruit as it would ferment in their stomachs. Inspiration hit and Tiffany came up with the name Drunk Elephant. She's a fun person who doesn't take herself too seriously and Tiffany wanted a brand name that represented that fun personality. 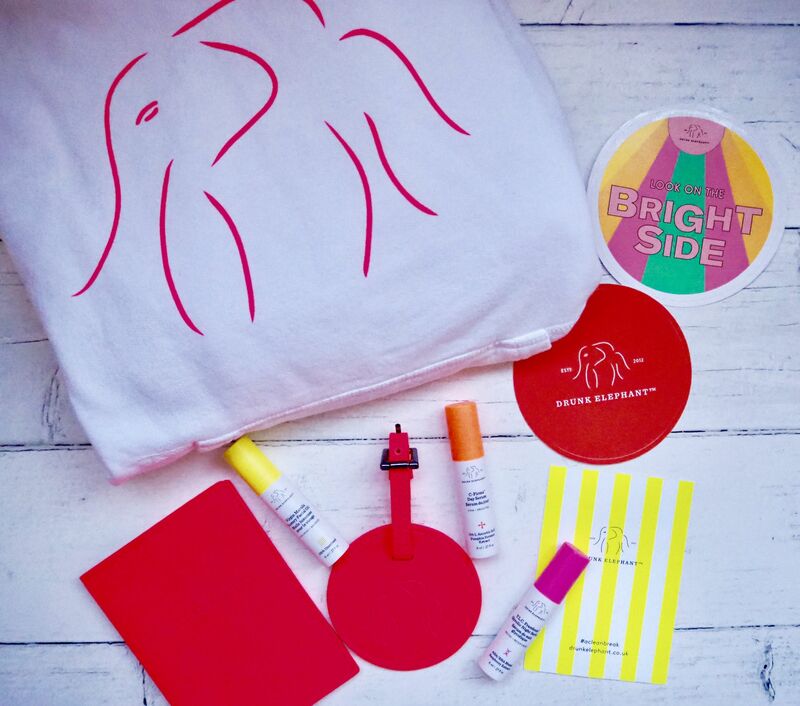 We then got talking about the beautiful packaging; the clean white with fun pops of colour. I mentioned I love the up-lifting design. Tiffany told us she had wanted the packaging to be another reflection of her personality. She'd always wanted to have a house with clean white walls and pops of colour and while at the time she wasn't able to do that with her home, she channelled it into her brand. She wanted something that you'd enjoy having on your beauty table or in the bathroom. Something that would deliver get skincare results but also make skincare fun and happy! We were keen to know if the range would be expanding into body care. Tiffany said that's everyone's favourite question and she will be expanding her range into body and hair care; it seems that's what her customers want next. Tiffany gave us another little spoiler, telling us that they're busy working away on those additions, it's all in the pipeline. There will also be further UK launches in the coming months and year. She mentioned the D-bronzer launch next April and there will also be some exciting new additions to the range. Tiffany was being very secret squirrel about it all but she did mention that the items are designed to complement the range and make it more rounded, so it seems we'll have to watch this space. 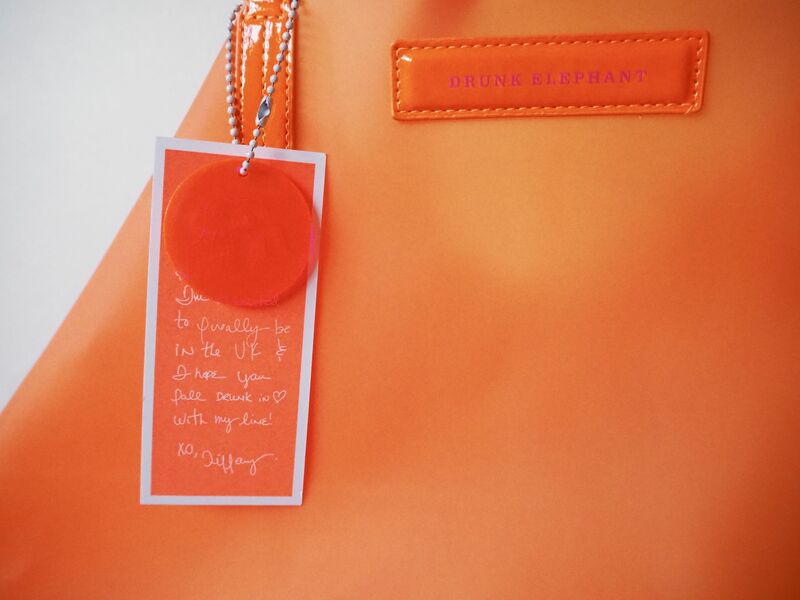 As we headed off from the event, we were kindly gifted a Drunk Elephant 'swag' tote bag. Inside was a Drunk Elephant passport cover and luggage tag (perfect timing for my upcoming weekend city breaks), a hoodie and other little cute treats. It really was a sweet touch. Thank you Space NK, Drunk Elephant and Tiffany for an amazing and inspiring event. 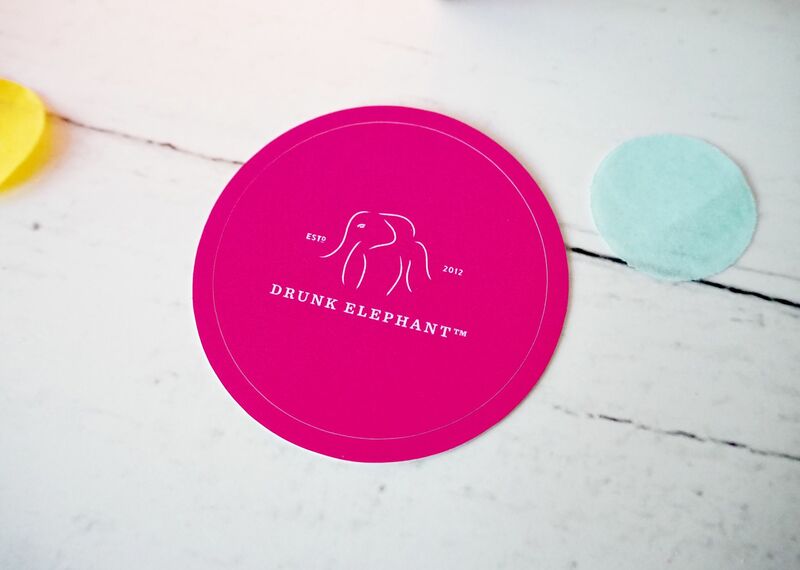 Have you had a chance to try Drunk Elephant? What are your favourite products? This is not a sponsored post. The Little Kit was purchased by myself and all opinions are based on my own experiences.